"Very well crafted, captivating and stylish. World-class stuff!" "Johanna Juhola is the new tango queen of Schweinfurt." Find a short biography HERE and a full bio HERE. Download printable photos HERE. A strongly visual concert with solo accordion creating musical stories and soundscapes together with fellow musicians and sound sources on video screens. Watch Johanna Juhola & Imaginary Friends compilation video HERE. Watch the (almost) whole concert with Johanna telling stories behind the compositions HERE. Read the full band bio and reviews HERE. Four highly-skilled musicians transcend style and genre limitations creating an eclectic blend of Argentinian and Finnish tango, electronica, ruminative Nordic roots and cheekily eccentric pop. Watch Johanna Juhola Reaktori: Road Assistance - music video HERE and Three Rounds of Tango -music video HERE. Watch Johanna Juhola Reaktori: Live UK tour video HERE. 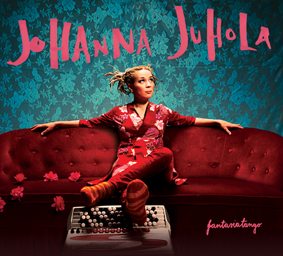 Textures of jazz, classical and folk are blended into Johanna's multifaceted tango-nuevo inventions, illustrating instrumental stories full of spontaneous and sometimes surreal flights of fantasy. Watch Johanna Juhola Trio: Road Assistance music video HERE and Four Minute Love Story video HERE. Download print quality CD cover photo HERE. Listen to a compilation of the tunes of this album on SOUNDCLOUD. Watch the music video Olavi HERE, Bipolär Tango HERE and Mummot HERE. Find the full discography HERE.